What so very few people realise of current events is that actions of the day are being determined by policies put in place years before, based on decisions made by actors no longer in the field. Thus, for all the focus on the spat between the current Environment Agency chairman and Mr Pickles, much of what is going on today rests on decisions made not by Smith, or his chief executive, but by Baroness Young, who was the hyperactive chief executive of the EA until 2008. And, back in 2007, when the policy which dominates current activities was being formulated, Young was in front of the Lords European Union Committee, giving evidence on the EU's Water Framework Directive, where she was to tell the Committee that, "making it work" was "sort of, 'Instant wildlife: just add water'" (p10: Minutes of Evidence). 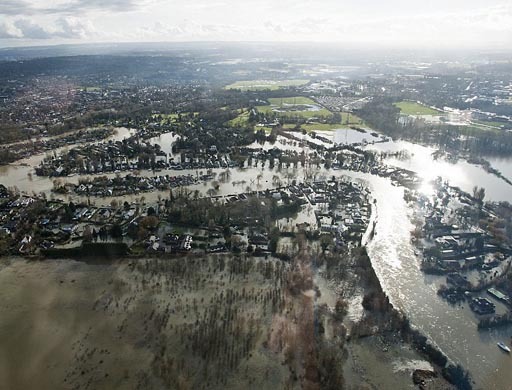 But Chris Smith was yesterday telling the BBC: "When I hear someone criticising the expertise of my staff in the environment agency that know hundred times more about flood risk management than any politician ever does, I am afraid I am not going to sit idly by". Only then does he add: "The Environment Agency is bound by the rules laid down by government", going on to talk about Treasury rules. But where Smith is failing is in his inability to identify the real "government" to which his Agency answers – the EU. At least Baroness Young back in 2007 was unequivocal about the impact of EU law. It is remarkable that, now the effects of EU policy are becoming evident, no one wants to talk about it. Thus, while the Mail is prepared to report flood victims claiming "they have been ignored by the Environment Agency because they are more concerned about wildlife and birds", readers are not being told why this is happening. And while one can sympathise with the victims and the call for cash aid, no one is being served well by the refusal to get to the bottom of the policy failures. But, if anyone wants a soft entry into this issue, and the EU involvement, they can start here. David Cameron is telling ministers to stop the blame game, but until that elephant in the room is recognised and brought down, the blame hasn't even started.